The TLP Transcription Editor is the main new feature added in version 3.4 of the open source transLectures-UPV Platform (TLP) for the integration of automated transcription and translation technologies into media repositories, just released by the MLLP research group. The transLectures-UPV Platform (TLP), developed by the Universitat Politècnica de València’s (UPV) Machine Learning and Language Processing (MLLP) research group, is an open source set of software designed to integrate automated transcription and translation technologies into media repositories and websites. Its main components are the TLP Database, Web Service, Ingest Service, Media Player, Text Translation Editor, and Website Translation Plugin+Editor. The MLLP is releasing TLP version 3.4, now available for download from the TLP page. The new Transcription Editor is our newest addition to TLP’s feature set. This new editor is designed to enable the user to revise the text of an automatic transcription without worrying about subtitle segmentation. 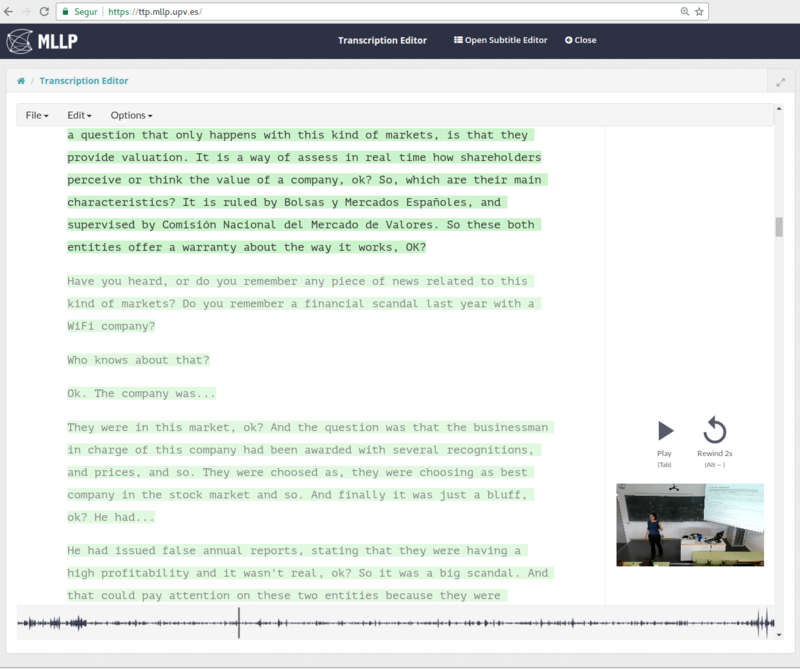 The Transcription Editor keeps your text in synch with the audio in order to make it easy to keep track of the original as you revise the transcription, while subtitle segmentation is handled in the background. This new interface has been designed to be useful for quicker post-editing of automatic transcriptions. Depending on your use cases, you can switch between the new Transcription Editor and the Subtitle Editor you already knew so as to adapt the text to your liking and control its segmentation into subtitles. A complete description of the functionalities of TLP 3.4 can be found in the TLP documentation. The fastest way to try the MLLP’s technology is to access the MLLP transcription and translation platform, which integrates our own software TLP and TLK (the transLectures-UPV Toolkit for speech recognition), our machine translation technology, and our text-to-speech synthesis technology. Just open a trial account and start uploading media and text files to try our automatic transcription and translation technology, and even integrate it with your own media repository via our API. So download TLP 3.4, or try it in the MLLP transcription and translation platform. We’ll keep you updated on new developments and releases of our software; just keep checking our website and follow us on Twitter, @mllpresearch. Posted in All, Tools and tagged Automatic transcription and translation, TLP, Transcription Editor.